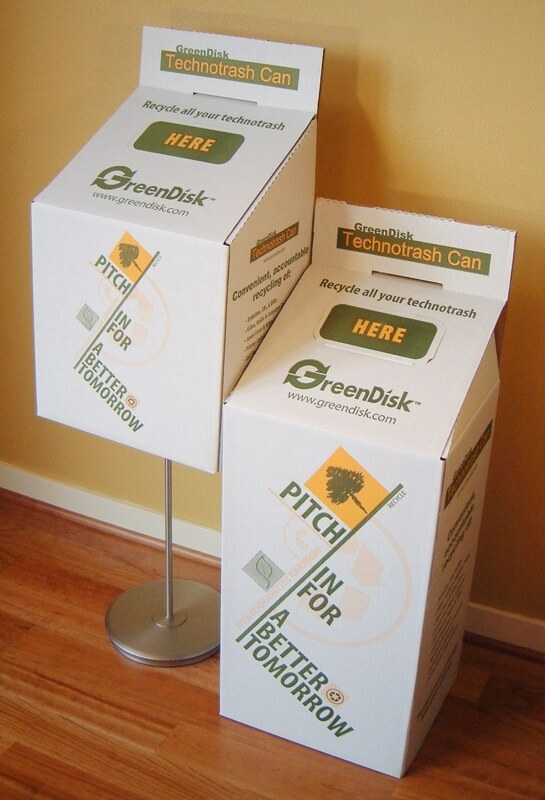 GreenDisk offers two full-service options that include a collection box, all transportation, the destruction of content on media, and recycling of associated material – the GreenDisk Technotrash Can and the GreenDisk eMedia Recycler. The GreenDisk Technotrash Can is a collection box specially made for easy disposal of a wide variety of technotrash. It is perfect for disposing of your technotrash at the time you no longer need it rather than waiting for it to pile up. No longer need some CDs or have some old diskettes, drop them in the box. Dead cell phones, mystery cables, old tapes - don't throw them in the trash can - throw them in the Technotrash Can! When the box is full, we responsibly recycle all your e-waste and take care of the secure disposal of all your private information. Then, for your records, we send you a Certificate of Destruction that documents compliance with regulatory requirements, company policies, or just your own personal preferences. The Technotrash Can Standard is small, enables you to recycle up to 35 lbs., and is easy to lift and move around. The Technotrash Can Tall is 10 inches higher than the Standard and you can ship up to 70 lbs., space permitting for both boxes. Important Information. Both cans are designed to conveniently fit into your office environment using just one square foot of your floor space (dimensions are approximately 1 foot by 1 foot with varying height). You can dispose of any computer-related waste that fits into your Technotrash Can. That includes anything from a CD to a laptop. Click here for a complete list. For computer component disposal (CPUs, monitors, printers), please use our Computer and Components Recycling Service. 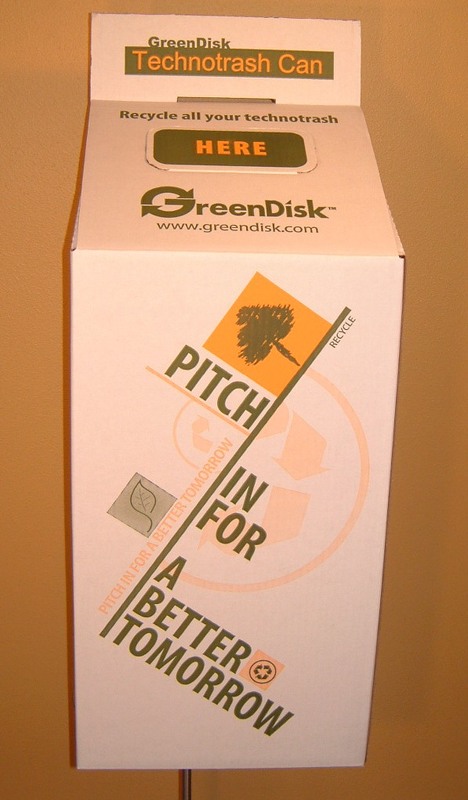 The GreenDisk eMedia Recycler is also a collection box similar to the Technotrash Can but focuses exclusively on media and their cases for organizations that place a priority on the secure destruction of their content and, specifically, desire regular compliance reporting for regulatory or internal corporate purposes. The eMedia Recycler is the preferred collection box for those wanting annual reports and recycling larger quantities of denser media (CDs and DVDs). The Standard is allowed up to 50 lbs. and the Tall is allowed up to 100 lbs., space permitting for both boxes. The eMedia Recycler also includes the individual Certificates of Destruction and the cumulative Enterprise Recycling Compliance Report as detailed below. Important Information. With either the Technotrash Can or eMedia Recycler, you conveniently pay one fee that includes the collection box, shipping of the technotrash to the GreenDisk processing facility, processing, and Certificate of Destruction. GreenDisk also offers a compliance report detailing an organization’s technotrash returns by location by weight and number of boxes. The report is generated upon your request; the charge for this report is $250. The Enterprise Recycling Compliance Report is provided free of charge annually for any organization that has purchased $1000 or more of Technotrash services during the prior two calendar years or who is in the eMedia Recycler Program. If you qualify for a free Report and your organization has different timing requirements, contact GreenDisk Customer Service. For further information, download the Technotrash Can data sheet for organizations or individuals or the eMedia Recycler data sheet. The Technotrash Can and eMedia Recycler are only available in the 48 contiguous states. To order using a PO (or check), download the GreenDisk Technotrash Recycling Order Form. Purchase requires prior approval. Please call 800.305.3475.